Since 1958, Rodgers Instruments has been committed to heightening the spiritual experience of audiences with the transformational power of music. Since its founding, Rodgers has been building the finest church organs available with expert craftsmanship, attention to detail and devotion to faithfully creating a true American pipe organ sound that is beyond expectation. Still residing in the same county in which it was born (Washington County, Oregon), Rodgers continues to push the art of organ building with the goal of faithfully delivering the emotionally and spiritually lifting experience of the American pipe organ sound to a new generation of performers and audiences around the world. Our organs not only capture the essence of the American pipe organ sound, they have led the way in making organs more accessible to places of worship, universities, music schools, and enthusiasts around the world. With faith, hard work, and dedication Rodgers has led the way in innovative digital and hybrid pipe organ technology. Highlights include building the world’s first all-transistor church organs, successfully creating the first pipe-electronic hybrid organs, and being the first company to use microprocessors, MIDI and USB storage in church organs. Throughout its history, Rodgers has also built magnificent pipe organs, including the world’s 17th largest pipe organ with over 10,000 pipes installed at Second Baptist Church in Houston, Texas. 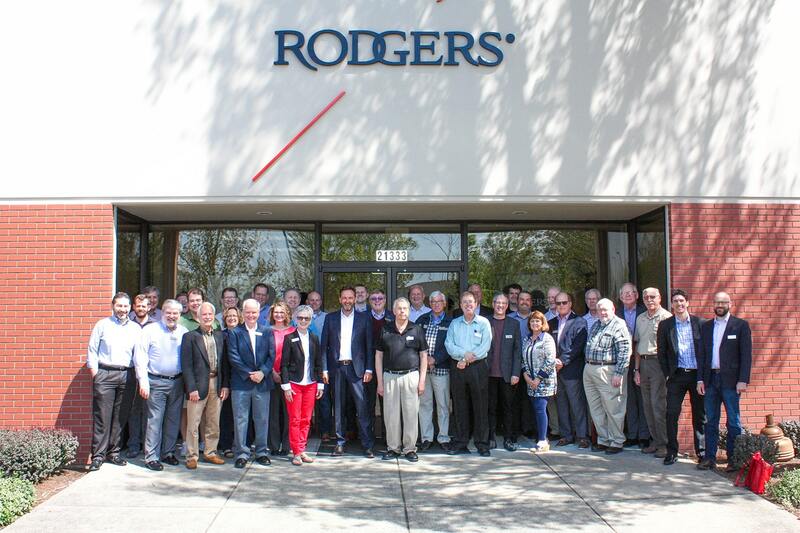 Throughout the year, Rodgers hosted several successful dealer meetings in which the Rodgers Dealer network showed up in great numbers to participate in the in-depth discussions and workshops. This along with the dealer network’s expertise and experience across many fields made for numerous constructive and valuable gatherings. During these meetings, the dealers learned about the company’s long-term goals; as well as discussions and workshops surrounding advanced technology, marketing, customer service, after sale service, and product development. Earlier in 2018, the Inspire 227 and the Inspire 233, the two centerpieces of the new entry-level Inspire Series were introduced, resulting in a complete line of quality organs from Rodgers. The state-of-the-art Inspire Series showcased what the Rodgers sound is all about; with real-time voice palette selection, newly sampled orchestral voices, new and improved samples, and a 32-note AGO pedalboard. The Rodgers film crew visited the wonderful city of Chicago and it’s surrounding areas to record a large number of new Rodgers Hybrid Organs testimonial and music videos. The first Church visited was the magnificent St. John the Evangelist Catholic Church in St. John, Indiana (pictured below). Also, a stunning installation in a beauitful church in Lutz, Florida was featured in our new series of hybrid organ videos and they will be out soon! A leading option in hybrid technology (Digital and Pipe Interfaces), the Rodgers Infinity Series is highly praised by some as the “most exquisite and best sounding digital organ ever built”. Rodgers Hybrid Organs leads the way, continuing to build on a rich history and legacy of innovation by uniting new or existing pipe organs with a Rodgers digital organ in a brilliant partnership enjoyed by thousands of churches worldwide. Rodgers Instruments was founded in 1958 by two visionary engineers and organ enthusiasts, Rodgers Jenkins and Fred Tinker. 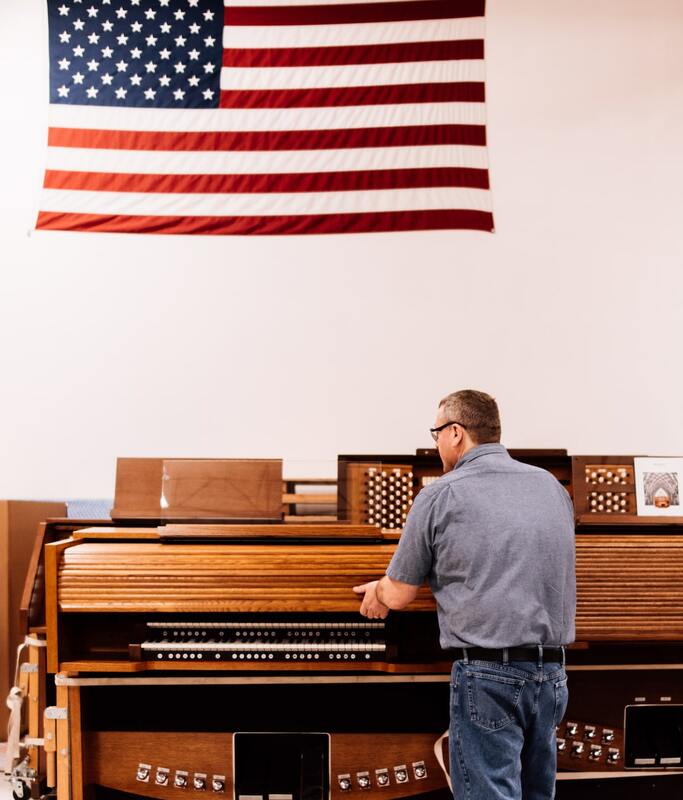 These American entrepreneurs would take a risk by quitting their lucrative jobs and build what would soon become one of the most prolific American manufacturers of church organs; thus, integrating Rodgers Instruments into American culture. Rodgers was born in the boom of technology, at a company called Tektronix Inc., established after World War II, a leading American manufacturer of oscilloscopes, logic analyzers, and video and mobile test protocol equipment. Tektronix was an early pioneer of progressive employment practices (later made famous by Google) which included no cashiers in the cafeteria, and the provision of “free time” in the work week for engineers to come up with their own inventions. The Rodgers organ was born from this practice of “free time”. Rodgers Jenkins and Fred Tinker had a goal to create the most realistic electronic organ. One that actually sounded like pipes. The need for such an instrument was felt keenly, as the electronic organs of the day did not sound like pipe organs. From the very start, Rodgers was intended to be the very best, the most advanced, and the most realistic electronic organ available. 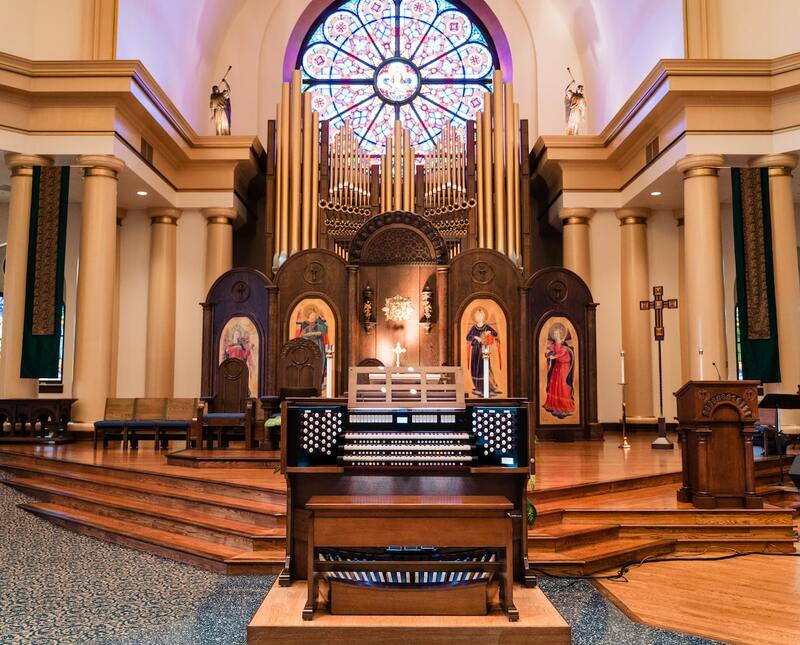 The company’s focus was helping make the transformational power of the American organ more accessible to churches, colleges, performance centers, and players by embracing advancements in technology. At Rodgers’ core was a strong engineering team that highly innovated the church and home organ. Rodger was born from this dedication to serve, and passion for elevating the human spirit through music. 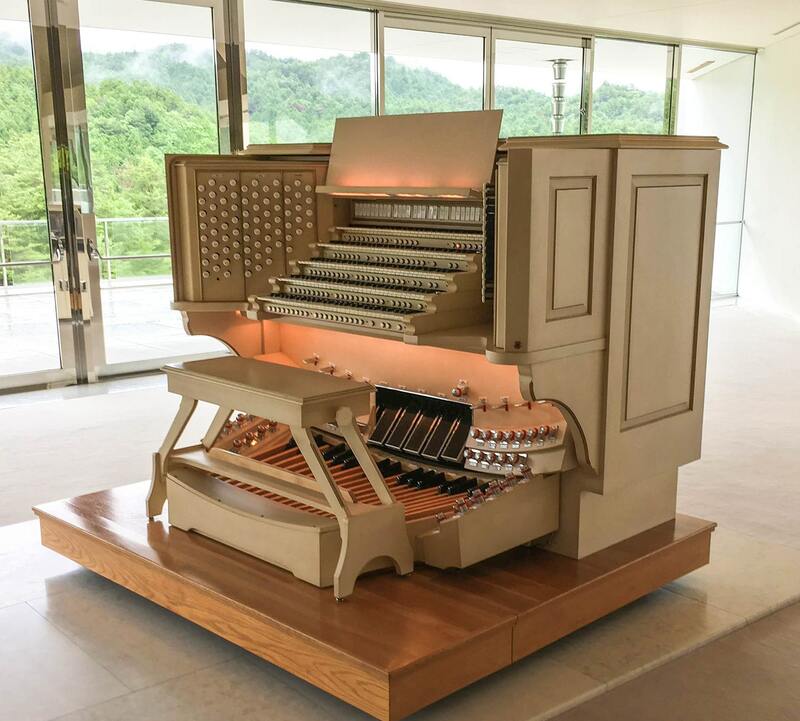 Amid much fanfare in 1974, an electronic instrument designed by Master Organist Virgil Fox and built by the Rodgers Organ Company was installed at the world-famous Carnegie Hall. On October 1, 1974, Fox debuted the Rodgers’ five manual Carnegie Hall organ in a sold-out concert. The organ and Fox were praised by Time Magazine, United Press International, The New York Daily News, The New York Post, and by noted critic Harold Schonberg in The New York Times. Carnegie Hall’s International Organ Series for the Inaugural 1974-1975 Season included Fox, Pierre Cochereau, Claire Coci, Fernando Germani, Herman Berlinski, George Thalben-Ball and Richard Morris. Virgil Fox also helped bring Rodgers organs into the limelight in the late 1960s and early 1970s when he used a Rodgers Touring Organ, built in 1966 and known as “Black Beauty,” for his “Heavy Organ” concerts, including a 1970 all Bach performance that included a light show at the Fillmore East Auditorium in New York City. This was the world’s first five manual and most powerful electronic organ at the time and was listed as such for a number of years in the Guinness Book of World Records. Organs were a passion of American tycoon Andrew Carnegie, who paid for new organs in thousands of community churches and was reported to have one in his home. A second black Rodgers touring organ was active in the 1970s. The “American Beauty” was based on Rodgers’s then premium three manual model, the “American Classic”. Concert organists who played on this instrument or “Black Beauty” (which continued touring under Roberta Bailey Artists International well into the 80s) included Ted Alan Worth, Joyce Jones, Pierre Cochereau, Herman Berlinski, Richard Morris, Keith Chapman, Douglas Marshall, John Grady, Frederick Geoghan, and Diane Bish. A sister five-manual instrument to the Carnegie Hall Organ, named by Fox the “Royal V”, served as Fox’s touring organ for the 1975-76 concert season, but proved unwieldy to tour with. The Royal V was used at Fox’s funeral in the Crystal Cathedral on October 25, 1980. The Royal V was, in 1983, refinished from black to white and permanently installed in the Meishusama Hall of the Shinji Shumeikai in Minsono, Japan. In mid-2004, this same organ was updated to newer Rodgers technology. Rodgers consultants on the project, revised and updated the organ’s tonal specification during the update to Trillium level Parallel Digital Imaging technology. Another notable Rodgers touring organ was Hector Olivera’s “The King”, a black four manual organ featuring a custom French specification that Olivera regularly and masterfully played. 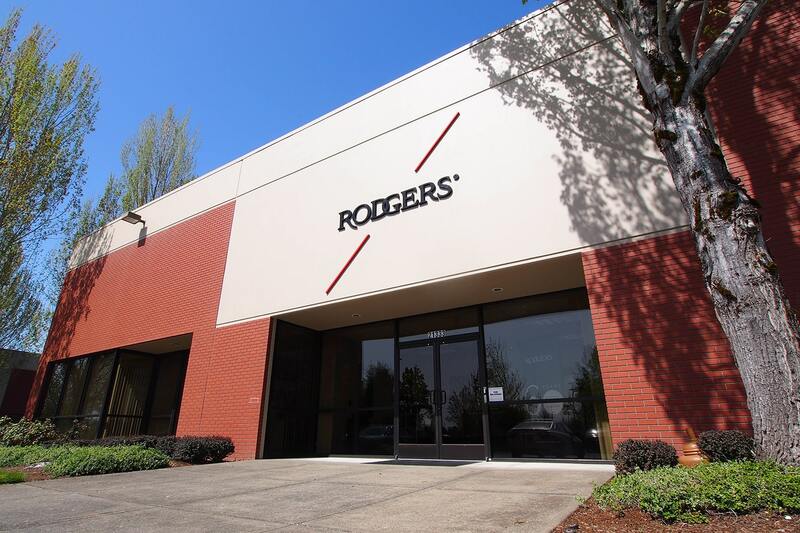 Almost 60 years later, Rodgers Instruments remains in Hillsboro, OR, and is unwaveringly committed to our founder’s vision of enhancing the spiritual experience with the transformational power of music. Rodgers will continue to push the art of organ building with the goal of faithfully delivering the emotionally and spiritually lifting experience of the American pipe organ sound to a new generation of performers and audiences around the world. Every member of our team brings an expert level of craftsmanship, attention to detail, and devotion to faithfully creating a true American pipe organ sound that is beyond expectation. Rodgers aims to build the finest digital and hyrbid organs available, for any setting, each and every day. Rodgers doesn’t just aim to build the finest quality American digital and hybrid organs, it aims to build lasting relationships with our customers. We are inspired to create art; and our passion for music, innovation, and our uncompromising standards of quality are all at the core of Rodgers Instruments.